A Magical Day in the Clouds! Hello and welcome back. Hope you got inspired by the new products and inspiration from Day #1 of sneak peek of Taylored Expressions January new release. Today is day #2 of the sneak peek. I am showcasing two new products today. 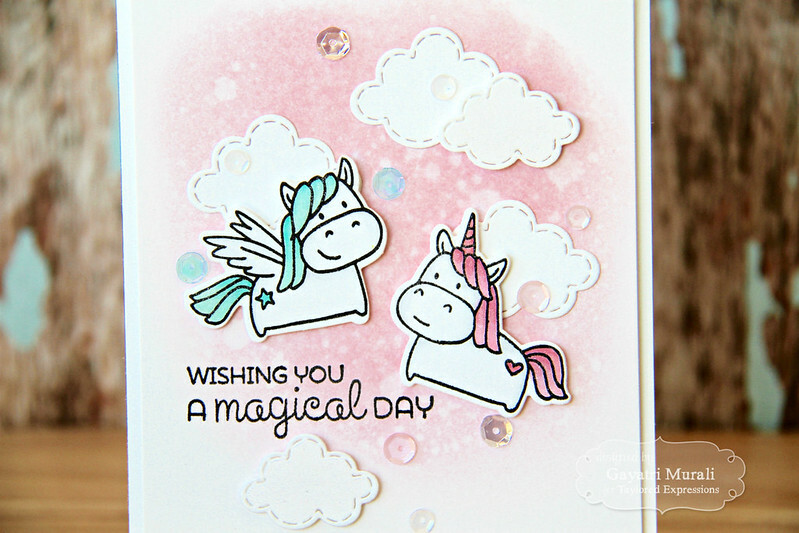 The first product I am showcasing is a stamp and die combo called Magical Day! Dragons! I Looove dragons. I got carried away a little. 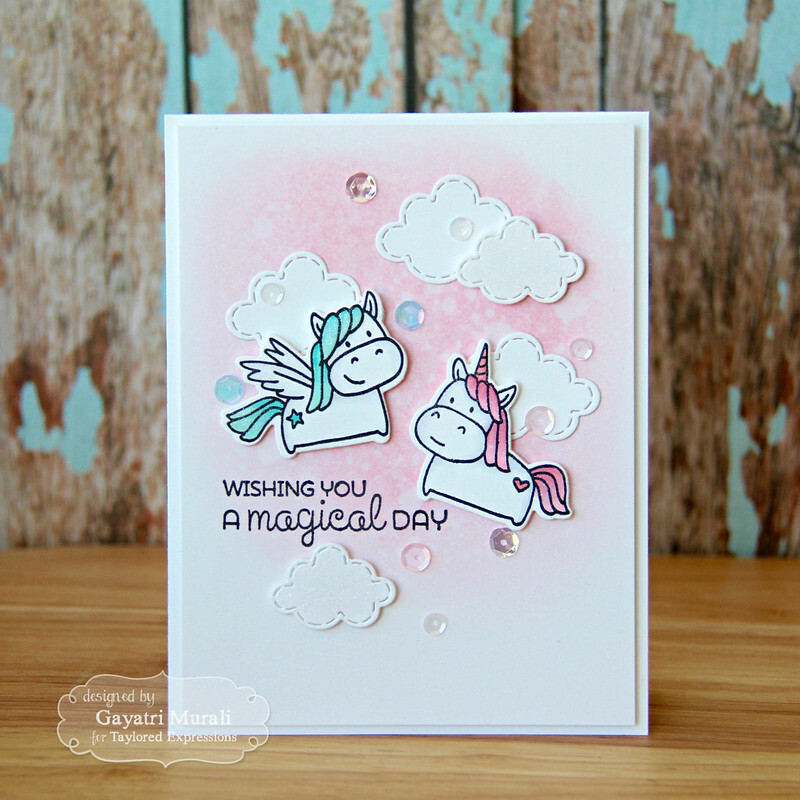 I combined the Magical Day stamp and die combo set with Cloud Nine background stamp and Stitched Cloud Duo die. I created the background by white heat embossing the background by stamping the new Cloud Nine Background stamp. Then I sponged distress inks – Salty Ocean, Wilted Violet and Candied Apple. I also die cut a cloud using Build a Scene Rolling Clouds die. I stamped the sentiment from the Magical Day stamp and die combo set using Oreo hybrid ink and adhered to the card front using foam adhesives. I stamped the dragon images using Oreo hybrid ink and coloured using copic markers. then I die cut them out using the coordinating dies. Then I also die cut a few of the new Stitched Cloud Duo dies. I adhered the die cut dragons using foam adhesives and the clouds die cut behind them flush. I then embellished the card using sequins from various TE sequins collections. The second product I am showcasing is Stitched Cloud Duo dies. The Stitched Cloud Duo dies are cute with the stitched details. 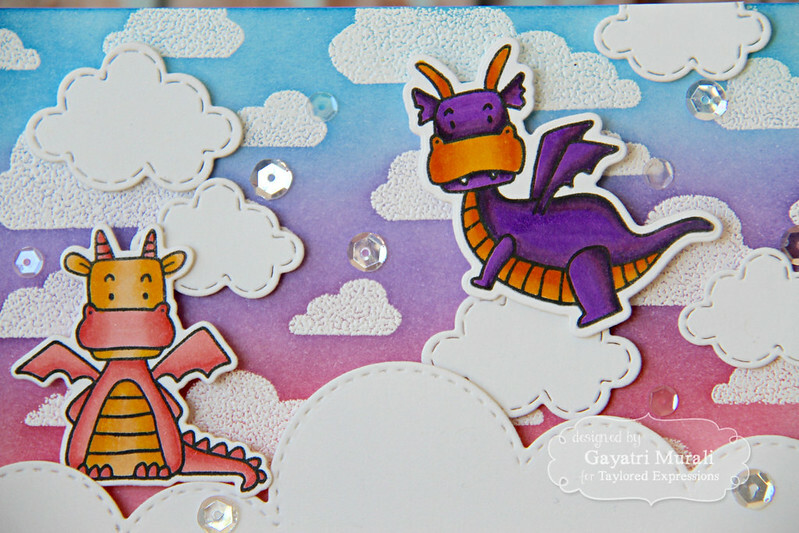 They looked awesome in my previous card with the dragons from Magical Day Stamp and Die Combo. 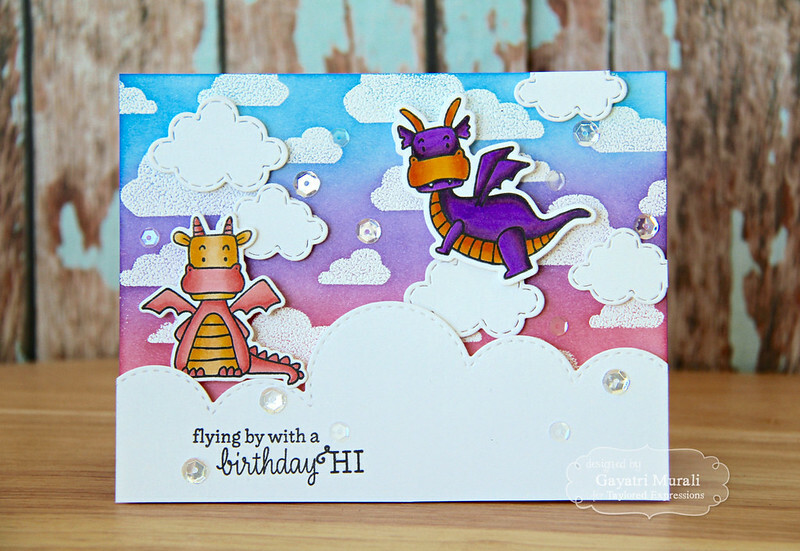 Here I combined the Stitched Cloud Duo die with another new stamp and die combo called Dreamer. I sponged the background with Spun Sugar distress inks, spattered with water. Then stamped the unicorns from Dreamer stamp and die combo, coloured with copic markers and die cut using the coordinating die. I also die cut a few of the stitched cloud dies. First I stamped the sentiment from Dreamer stamp and die combo using Oreo hybrid ink on the background. Then adhered three of the largest stitched clouds flush to the background with the unicorns overlapping of the clouds with a bit of dimension. The smaller clouds I adhered using foam adhesives. Then I embellished using sequins from various sequins collection from Taylored Expressions. I brushed the coloured areas of the unicorn using Wink of Stella clear shimmer pen. This is just beautiful! Such adorable details!! Love the clouds! Wow such beautiful color. Love all the details in the clouds.